LUSH believes that all you need is love! I believe that all I need is 75% off Valentine chocolate, the day after. Admit it... You've rolled out of bed, as the dawn's early light broke the day after the Day of Love, splashed some water on your face, slicked on a little lip gloss, put your hair in a messy bun, put on your biggest sunnies, a coat over your jammies, grabbed your wallet and run out to hit the store to be first in the door to get the marked down deliciousness. Maybe I have been married way too long. After twenty - six years of wedded... armed bliss! Valentine's Day isn't one of those days that is super high on my list of favorite holidays. My husband and I have developed a rhythm to showing one another, in little, spontaneous ways how we feel. The calendar long ago stopped being necessary to that. I'm not Anti-V-tine's Day, I'm just not as enthusiastic as I once was. My idea of a great Valentine's - ish celebration is a relaxing, pampering soak. Preferably up to my chin in just about hot enough to boil a lobster water, spiked with fragrant, skin loving ingredients that delight my senses as they pamper me. Luckily for me, LUSH has just the stuff I love to get the job done. Draw a tub, drop in a fresh, hand made bath bomb, grab a big mug of great coffee, a box of those marked down choccies I fought off the other Dawn Warriors in PJ's for, my phone and sink in. 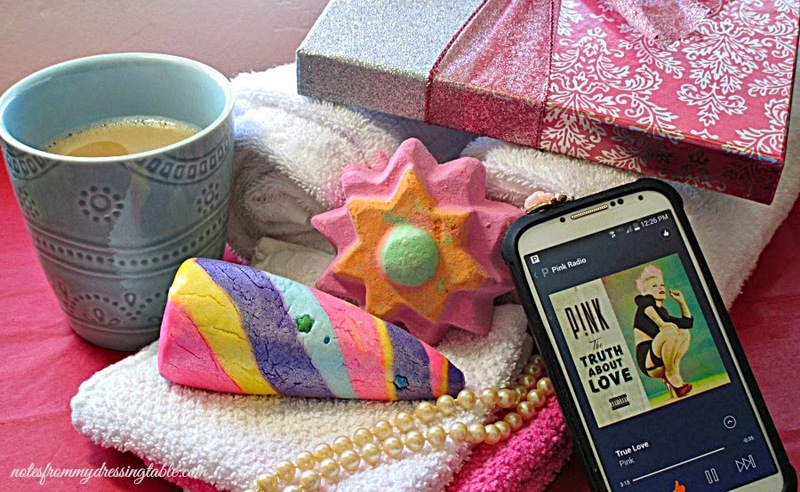 Balance my coffee and sweets on the tub's edge, pull up Pandora on my phone so that I can listen to my favorite music while I luxuriate, sip, nibble, surf the Interwebz and argue with idiots on political websites. Ahh... Heaven. LUSH hand creates beautiful cosmetics and bath and body care from fresh, natural and safe synthetic ingredients that are ethically sourced. Many of their products are vegan and LUSH never tests on animals. Walking into one of their stores is a sensory experience. One I don't get, very often as the nearest to me location is a drive to the Phoenix Metro area. Hey, LUSH, want to build me a store, in Prescott? Yeah... They're going to get right on that. Happily, LUSH has a website and they were kind enough to send me a couple of their beautiful, hand made, limited edition Valentine's Day bath goodies to share with you. Let's take a look, shall we? Floating Flower Bath Bomb: 4 oz $6.95. Place this beautiful flower gently in your bath and watch it as it floats, fizzes away and releases it's sensual jasmine fragrance into the air and pink, orange and green hues out onto the water. Sink into the tub and let your skin slurp up all of the softening and conditioning ingredients while you soak your cares away. Step out relaxed and smelling absolutely beautiful. 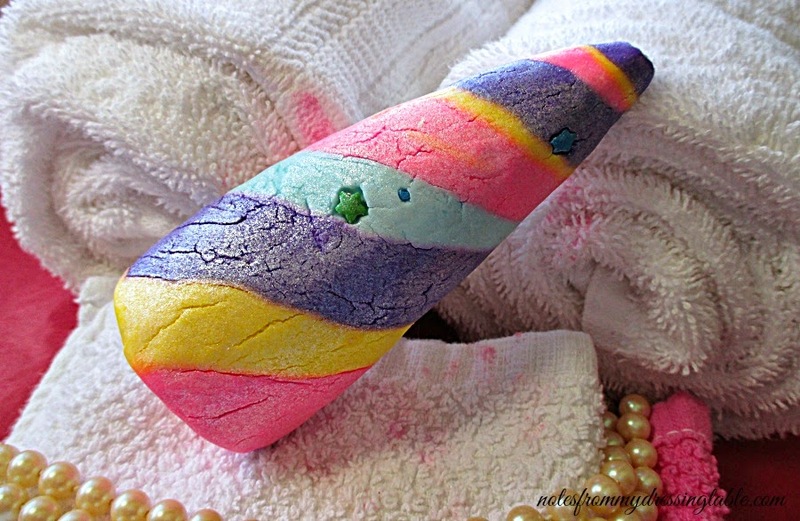 Unicorn Horn Bubble Bar: 3.5 oz. 7.95 is a treat for the senses and the skin. As this fun, colourful, hand made bath wonder dissolves it releases lush, calming lavender, ylang ylang and neroli to soothe you while pink, purple, yellow and blue spirals out across the water and soft silver shimmer trails throughout. Bright candy stars float along the surface to complete the magical experience. Gentle reader, these gorgeous LUSH goodies and their other offerings for Valentine's Day are limited edition and in ever dwindling supply. If there is anything you see that you think you must have, get it, while you can, so that you and perhaps someone you adore, can enjoy these treats. Join LUSH on Facebook, Twitter, Instagram, Pinterest. They also have a YouTube Channel and are on Google +. Do you use LUSH products? What are your favorites? Please share your faves, enable me, I need more. I was saying the same thing once I realized it's the same scent as Flying Fox. I was thinking about heading to LUSH today to pick up some, and more pink fun for my daughter. haha, you're so funny! I love that your sense of humor always shines through :) I guess hubs and I are still in the lovey-dovey stage, but i'm sure I'll be all over reduced price chocolate in a few years! I love Lush products. Their soaps are my favorite. Loved this post! LUSH is awesome! Some adorable stuff available over at Lush now. 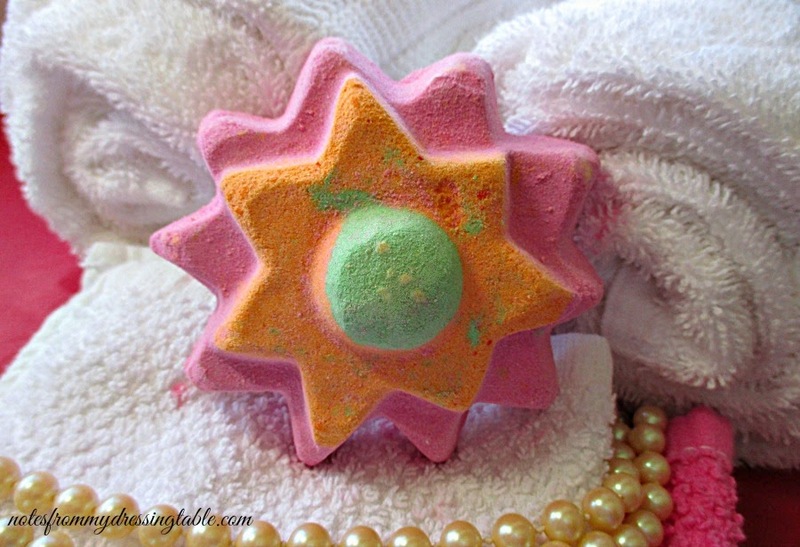 If you like fruity scents, Erika, try The Comforter bubble bar and Space Girl ballistic! I love lush! The unicorn horn is great. I love lush. These items are so cute! You have to try their face masks - They are incredible! I love love LOVE LUSH!!!! Your pictures look simply AMAZING!!! Great post girl!! Mama, you are my IDOL in the marriage department, 26 years, wowwww!!! Btw, I like your new banner! YES girl... rock those 26 years! I love your photos - looking fabulous and woohoo for Android lovers. Thank you. love. Yassss! Droid forevah! Nope. Going to behave. If you have a LUSH near you, they may have them in stock. They are sold out on the website but I'm hearing that they have plenty in stores, yet. I hear that they are wonderful. I need to go in a store and scope them out. I love a nice, hot beverage in a hot bath. Call me crazy. I find it refreshing. Oh, and they smell so good. Ooo! I must! Thank you for the suggestions. Thank you so much for your kind words. Get some gorgeous shower gel to pamper yourself with in the meantime. The Floating Flower is heavenly. If you like jasmine, you would love that scent! I need to try them. And I have to get that shower gel I'm wanting. Heh! Heh! Don't get between me and something I want. I'll mow you down. Thank you so much. Yeah, watch out for daughters, your pretty pink stuff isn't safe. LOL I think I need a barrel of Flying Fox! Seriously. so...(I've been in a LUSH store once...I know, right???? ), the very colored and glittery ones don't leave color all over the tub? or do they? Name my faves... it'd be easier to name what I don't like. But I like everything LMAO Porridge Soap and Mint Julip lip scrub stand out to me because they were among the first of my faves. It seems with LUSH even in scents I don't think I'll like, I like. Blessing and a curse because I spend SO MUCH money there. LOL we totally buy the after holiday v-day candy too! Preferably the pink kisses that are white chocolate & raspberry...nom....& yes to all the LUSH. Just all of it. Every day. Till I'm out of money. Mmm.. I haven't tried the white choc and raspberry. That sounds yummy. Yeah. LUSH, man. It would be easy to rack up a huge receipt. Oh, that smells good! Yep! I need this... Leave, broke and crying. LOVE all of the goodies from LUSH. I love the Vanillary line....Fairy Dust, Snowcake Soap, You might like Sikkim Girls perfume. It's a nice heady floral, like the Floating Flower! All of your suggestions sound like just the stuff I will love. I'll have to check them out! I want in on the LUSH party!! If my boyfriend just gave me a bag of unicorn horns for Valentine's Day, I'd be the happiest girl ever. That's a bummer! I hope that they had some at the mall location and you could stock up. I'm still in a snit at Lush. They discontinued my all time favorite bubble bar. The Ma bar. How the heck can they discontinue something that smells like chocolate and butter toffee? What is this world coming to? !